White male suspects detained in Minneapolis Black Lives Matter shooting case. 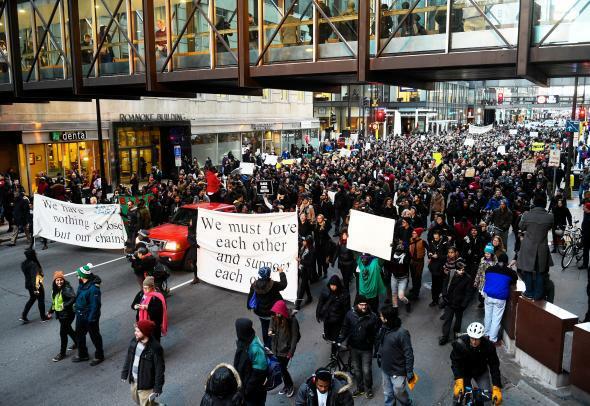 Black Lives Matter protesters marching toward Minneapolis city hall on Nov. 24, 2015. Allen Lawrence “Lance” Scarsella III, 23, was arrested in Bloomington. Sources said Nathan Gustavsson, 21, of Hermantown, and Daniel Macey, 26, of Pine City, were taken into custody after they turned themselves in. All three suspects are white. Earlier Tuesday, police arrested a 32-year-old Hispanic man in south Minneapolis, but he was later released because, police said, he was not at the scene of the shooting. The paper reports that the case may be treated as a hate crime; a Black Lives Matter spokesman said the Monday shooting occurred after “a group of white supremacists” arrived at the site of the protest. One of the suspects is known to have posted an image of a Confederate banner on his Facebook page. The ongoing protests are related to the death of Jamar Clark, a 24-year-old black man who was shot and killed by a police officer under disputed circumstances on Nov. 15.